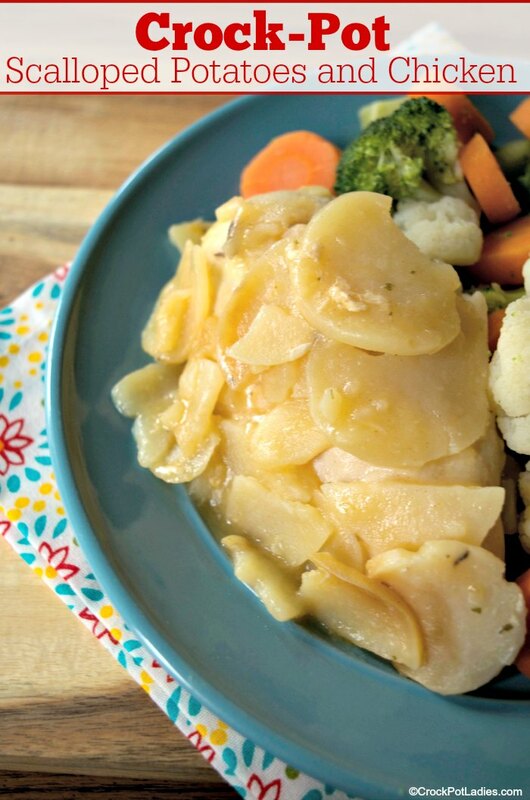 This recipe for Crock-Pot Scalloped Chicken is an easy dish to put together, only needing 3 ingredients! 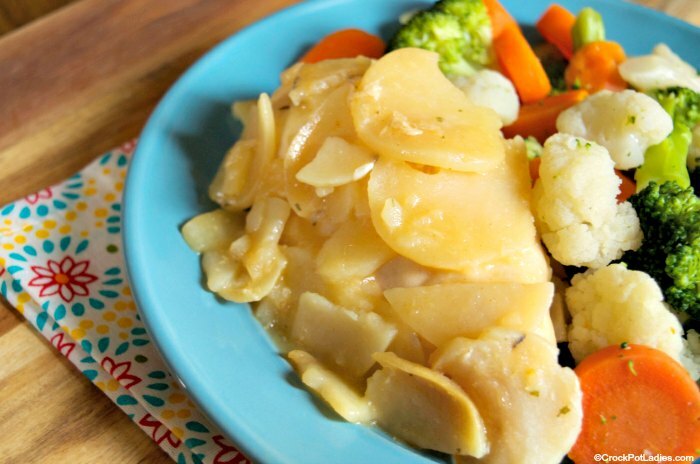 One box of scalloped potatoes, chicken & water… voila, you have dinner made! If you are anything like me, some days are just plumb crazy running the kids around to sports, events, appointments and everywhere else they need to go. Some days you just need something EASY to throw together for dinner. 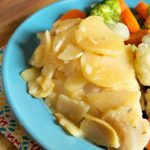 This recipe for scalloped potatoes and chicken made in the slow cooker has to be one of the easiest recipes I have ever put together. And my family really liked it. Start by putting 4 boneless skinless chicken breasts in the bottom of your slow cooker (a 6 quart or larger works well here…you could probably throw this in a 5 quart slow cooker and it will be just fine too). Then I added the potatoes from a box of Betty Crocker Scalloped Potatoes over the top of the chicken. Open up the seasoning packet that came in the box of scalloped potatoes and mix it with 2 cups of water and pour that all over the potatoes and chicken in the slow cooker. 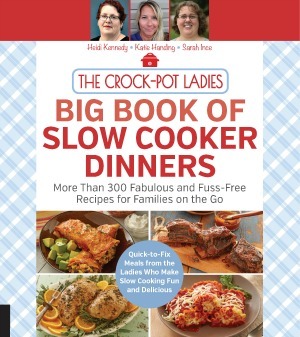 Put the lid on your crockpot and cook for 8 hours on LOW or 4 hours on HIGH. And that is it. Could a recipe get any easier I ask you? This recipe is also very versatile. You could add some veggies (broccoli or cauliflower would be great), add some shredded cheese, sprinkle in some additional herbs and seasonings. Go wild. Or keep it simple…because some days I just need simple. Place the chicken in the bottom of a 6 quart or larger slow cooker. Open the box of scalloped potatoes and cover the chicken with the potatoes from the box. In a bowl mix the seasoning packet with the 2 cups of water and stir well. Pour the seasoning packet with water over the potatoes and chicken. Cover and cook for 8 hour on LOW or for 4 hours on HIGH. To make clean up a little bit easier you can line your slow cooker with a Crock-Pot Liner. 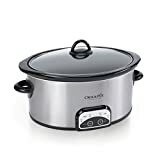 This is totally optional but I find these help make my life just a wee bit easier as I can just remove the liner, toss in the trash, wipe out my slow cooker quickly and put it away after dinner is done. Thanks Nadene! I have fixed that. I totally hear you on not wanting to go out in the cold Jennifer! It is in the 1 digits this morning here in Wyoming. Burr! Is the chicken cooked or uncooked when it is put in the crockpot? Does the chicken have to be cooked before going into the crockpot or can it be frozen? The chicken in this recipe goes in raw (uncooked). While this recipe has not been tested using frozen chicken breasts it should be just fine. You will just need to allow some extra time (about an hour or so) to allow for the frozen chicken to thaw and then cook in the slow cooker. Not a fan of chicken breasts. Can I use legs instead? Hi Ciara, This recipe has not been tested using chicken thighs, however it should work. Let us know how it turns out for you!